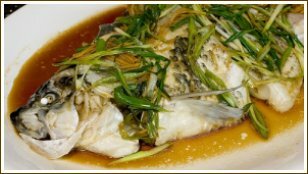 Steaming fish is one of the lightest and healthiest ways of cooking fish. This method allows the fish to hold its natural flavors without losing most of its nutrients, and does not require any additional fat. It's suitable for most kinds of fish in any form, from steaks, fillets, or whole fish. Steaming is a wet heat method of cooking. The food, or in this case, the fish, is cooked in a closed cooking vessel with just enough liquid to generate steam. The liquid is usually water, wine, beer, broth, stock, or a combination of those. Aromatics of herbs and spices can also be added to provide more flavor. Have you ever steamed vegetables before? Well, steaming fish is pretty much the same for the method of cooking fish. If you don't have a steamer, you can still make do perfectly fine with what you may already have in your kitchen. What If I Don't Have A Fish Steamer? Basically, you will need a cooking vessel such as a pot with a tight lid, and a rack that will sit inside the pot. The liquid will be poured into the bottom of the pot, and the rack should be positioned at least an inch above the liquid. The fish will lay on the rack. With the pot covered, cook with the liquid simmering or boiling until the fish is done, about 8-10 minutes per inch of thickness. The fish should flake easily at its thickest part. Alternatively, you can also use either a deep pan or a wok. You can place the fish on a plate or platter, set it inside the pan on top of something to hold it up off of the bottom of the pan and above the liquid. You can use metal canisters like small jalapeno cans, small olive cans, tuna cans, etc., to set the plate on. Just be sure to leave enough room around the edges of the plate to allow the steam to flow through. Some woks come with racks and dome shaped lids. Some pot and pan sets come with pots that have matching strainer pots with them. The strainer pot can fit securely on top of another pot with the liquid holding inside that one. Place the fish inside the strainer pot and cover. Other possibilities can be a turkey roasting pot or a fish poacher. How Does The Fish Cook? The fish is cooked from the water vapors, which is the steam, given off from the boiling liquid. Hence the word steaming. The fish should never come in direct contact with the liquid while it is cooking. Steaming fish can be cooked a little more quickly than cooking it directly in the water alone. Steaming allows you to enjoy fish in its purest and simplest form. What Kinds Of Fish Are Best To Steam? Lean and delicate fish are usually good for steaming. Freshwater fish such as bass, catfish, and trout are a nice choice. More oily and flavorful fish like salmon really showcase their richness when steamed. When plating, you can enhance the flavor a little by adding lemon, green onions, or ginger, with a splash of rice wine or dry sherry. Feel inspired to use what you like.